I visited the Albertson’s by my mom’s house in Carlsbad tonight. As usual, I checked out their wine selection, just to see what they had and more importantly, how much was charged. I have been accused of being snobbish about grocery store wine, but I know it serves a purpose. These are the every day wines that are accessible. I know that the last thing I want at the end of my day is to make multiple stops for dinner and wine. I get it. I just believe that as the Wine Director of a restaurant, it’s my job to provide wine that makes a visit an experience. Many of us don’t get to go out every day, and when we do, we want something special, something better than we can make at home. Special, small production, hand made wines will never reach the economy of scale necessary to be featured in a grocery store. Wine that is outside the every day, that runs out at the end of the vintage and whose price fluctuates based on the whims of Mother Nature. Wine that takes lucky wine directors and sommeliers many of our waking hours, months, years to unearth. So forgive me. And drink what I offer. Enough of the soapbox! On to the business, I mean bottle at hand. The point is that I did not purchase a bottle at said Albertson’s because I didn’t want to spend the money when I could open something I had at home. Three months of unemployment took a toll on the cellar. I’m getting to a critical level, where I need to stock up with some everyday wine so I can back away from the nice stuff. Today I opened the bottle I most fear. I purchased it at the wine shop at The Orleans in Las Vegas, must have been 3 years ago. I intended to spring it on my blind tasting group, but since it isn’t on the Fair Game list, I thought better of it. I haven’t come across the right time to open it. I hoped it would not taste good so I wouldn’t be tempted to polish it off. Palate: off dry, very few of the elements on the nose make it to the palate; medium minus body, high acidity, low complexity and finish, unbalanced, of low quality. 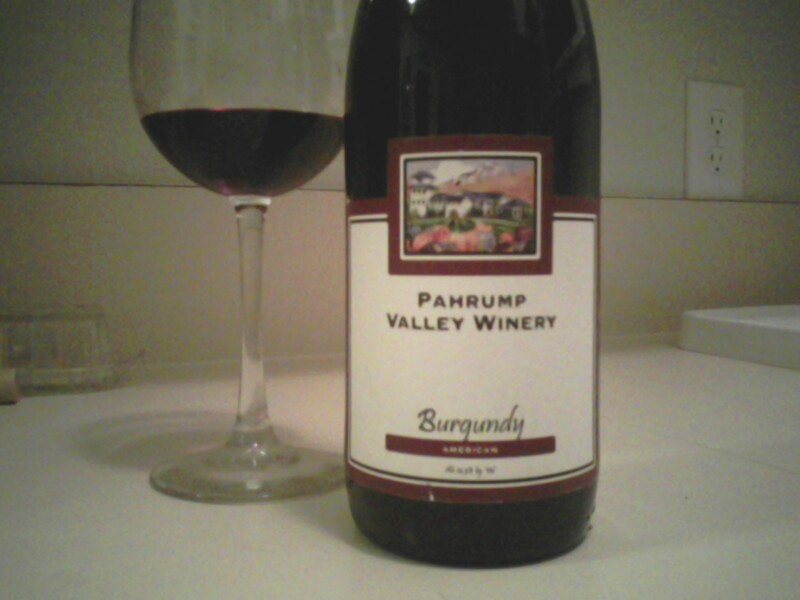 Knowing that this is a non-vintage Pahrump Valley Winery American appellated Burgundy, I could not hazard a guess as to its varietal, origin or vintage. The label told me everything, the grid told me nothing! And no, I can’t finish the glass. I will buy some Sprite tomorrow and make spritzers!